Lawrence of Berkley, L. Adams, and I hit the road Saturday morning for a little photo expedition. Along the way we drove through Bowling Green Ohio, home to Bowling Green State University and a cool little greasy spoon called "The Corner Grill." We decided to try the place for lunch and were pleased to find that it was good, cheap food and had plenty of character to share. Of course being a photo expedition though Larry and I had to bring the cameras in with us. So as we waited for the food to arrive we played with the variety of subjects and the few lenses we brought in. 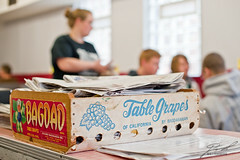 One of the cooler items was this old grape crate being used for holding the newspapers. How cool!